About 30 years ago, a band from Boston released a debut record so potent, unexpected, and lyrically arresting that it and the band became legendary. That record was Surfer Rosa, and that band was Pixies. They'd formed in 1985 and released their first EP, Come on Pilgrim, in 1987, but Surfer Rosa was a revelation, and the band went on to release three more solid and inventive alternative rock records before they disbanded acrimoniously in 1993. LOUD-QUIET-LOUD! 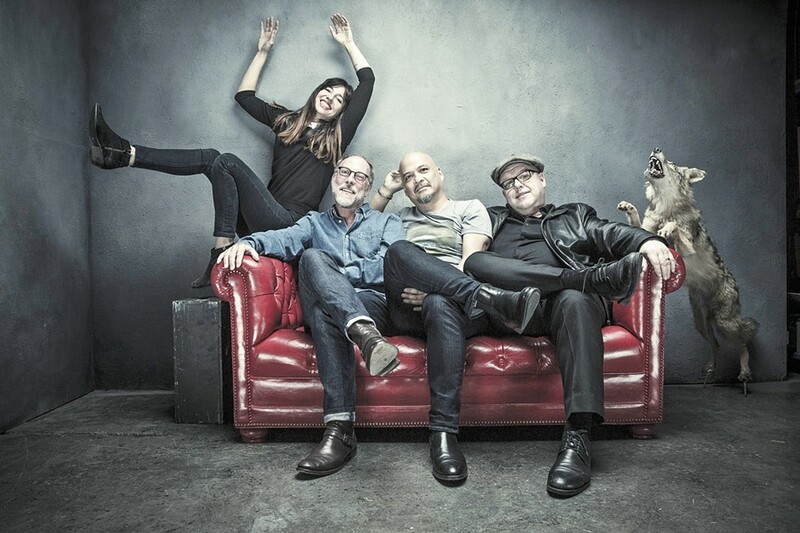 Famed alt-rock act Pixies play Dec. 12, in the Fremont Theater in support of their newest album, Head Carrier. In the coming years, frontman Black Francis released nearly 20 solo records, but Pixies eventually reunited in 2004. Original bassist Kim Deal quit again in 2013, and Kim Shattuck (The Muffs, The Pandoras) was hired as touring bassist in that same year but was soon replaced by Paz Lenchantin (A Perfect Circle, Queens of the Stone Age), who recorded on their newest record, Head Carrier, a reference to third century martyr St. Denis of Paris, a cephalophore who legend has it was decapitated but picked up his head and walked for miles while preaching a sermon of repentance. Lenchantin was actually brought on board to tour for Pixies' previous album, Indie Cindy, their first studio album since 1991's Trompe le Monde and the first to not feature Kim Deal. Former The Fall bassist Simon "Dingo" Archer played bass on the recording. I mention all this because Numbskull and Good Medicine Presents host Pixies on Tuesday, Dec. 12, at the Fremont Theater (8 p.m.; all ages; $39.50 plus a service charge at Boo Boo Records or $47.83 at eventbrite.com). The Orwells open the show. New Times interviewed newest member Paz Lenchantin via phone while she hiked through her Silver Lake neighborhood with a headset on. New Times: You started touring with the band in 2013 but didn't become a permanent member until 2016. That's a pretty long tryout. What finally clicked? Paz Lenchantin: Oh, I think it was a process. I don't know if there was a moment—da-da-da—but we were coming out with a record, so when we announced it, it kind of made things permanent in its own way. You can't erase my membership in the record. The record will stay around whether I'm living or not. NT: That's a little macabre. I hope you're not planning on dying or anything. What's the most challenging aspect of being a newcomer coming into a well established, and one might even say legendary, band? PL: The challenges? I'm not really challenged by a group of guys; however, touring can sometimes have its challenges. Sometimes we can be in a bus for long periods of time getting to the next destination and there can be complications with the bus—those are challenges—but the guys, they're my family. NT: Do you have a favorite Pixies album? PL: Funny how that always changes. It's one of those things, you know? How am I feeling today? My favorite now might not be my favorite tomorrow, and I hope that's how everyone feels. Surfer Rosa is pretty incredible 30 years later. I mean, wow, it still resonates. That's when you know something's timeless. I have to say Head Carrier has to be my favorite album of the year. Not to be selfish, but it's very exciting to make a record with Pixies. NT: Were you aware of St. Denis and what a cephalophore was before Frank showed up with the songs for Head Carrier or did you have to look it up like I did? PL: He does talk of some things where it does feel great to kind of revisit or learn some abstract history or poems from Black Francis, but I didn't have to look it up because we talked about it. Cephalophore was originally going to be the name of record, but it was a little more abstract so we decided to change it to its literal meaning. NT: I think the best new thing you bring to the band is your backing vocals, which add a brighter element to Pixies' sound, and you take lead vocals on "All I Think About Now." That's my opinion. What's yours? What do you thing you bring to the band? PL: Well, honestly comparing is not something I'm doing. We are where we are today. Black Francis isn't the same as he was before. His voice and tone has changed. He's a little bit raspier, a little bit more mature. Kim Deal was herself and I'm myself, and you have to be true to yourself. So what's new? I'm new. They didn't have me before, so I guess, me! And they seem to like me, and that's cool. Sometimes people do need a little change, a little something to revamp, re-fire, and refuel. NT: I wasn't asking you to compare yourself to Kim Deal, only to tell me what new element you brought to the band, but since you mentioned her, I hear you co-wrote "All I Think About Now" and encouraged Frank to make it a thank you note to Deal. True? PL: That is correct. It was very quick. We'd done all of these songs and it was the last song we wrote. We only had a few days left in the recording process and that song came out of nowhere, but without that song it would be a different record. I'm glad it happened but it was totally last minute. Francis said he wanted me to sing it, and it seemed like a no-brainer that if I was going to sing about anything it would be a song about Kim and especially a kind of thank you letter. I can relate to wanting to write a thank you letter someone—it seemed like a universal type of song, a song many of us can relate to. NT: You also play violin, piano, and guitar. Any plans to utilize those talents as a member of Pixies? PL: As far as talking about it, it's not like we plan. If we're working on something, it's more like, "Oh wow, a little piano would be great there," and I did play a little piano on "Classic Masher," but it's subtle and one note anyone could play. If a song can sound fine without all the extra production, you don't need it. If it needs a string arrangement and orchestra, Pixies have done that, too. NT: I know you're still out touring with Head Carrier, but I can't help but ask, is another album in the works, and if so, where do you think it's going? I think Head Carrier definitely went in a more cohesive direction from the previous, Indie Cindy, which seemed pretty disjointed. PL: Yes, we're working on the next one. I think Indie Cindy was sort of a transitional phase—I mean they just lost a member—but the new one is going to be a different record. Just different. There're some really strong songs on Head Carrier, including "Classic Masher," "All I Think About Now," and "Tenement Song," and though Pixies aren't quite the explosive band they were in the '80s, they still put on a great show. LOCALS ONLY Moonshine Collective headlines a four-band SLO Gathering show on Dec. 9, at the Fremont Theater. Also this week from Numbskull and Good Medicine is the SLO Gathering featuring Moonshiner Collective at the Fremont Theater on Saturday, Dec. 9 (6:30 p.m. doors; all ages; $15 presale at Boo Boo Records or ticketfly.com or $20 at the door), with supporting acts Truxton Mile, Bear Market Riot, and Brass Mash. Moonshiner frontman Dan Curcio has been through a lot of changes over the years, starting as a member of Longview, which became Still Time. He then formed the rotating ensemble Moonshiner Collective, but then he decided to become a one-man band with foot percussion and harmonica. "For about a year before we put this current lineup together, I had been experimenting with a one-man-band style setup where I play foot percussion, guitar, harmonica, keys, with these songs," Curcio noted. "My wife and I had just had our baby girl, Noa, and my music is the sole source of our income which, as you could imagine, was a bit scary and I felt the need for flexibility with this band and my career in general. I loved the challenge of learning the one-man-band techniques and breaking songs down in different ways. I'll still do one-man-band style performances for certain intimate shows or tours here and there where we advertise it as such, but ultimately I want to be a part of a team and build something far greater than what I can accomplish on my own." 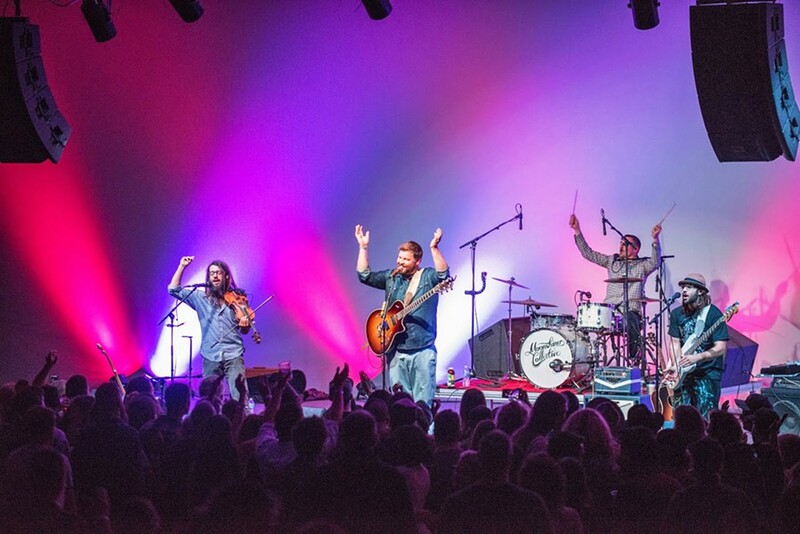 Moonshiner's current lineup includes Curcio (vocals, guitar, piano), Daniel Cimo (violin, banjo, keys, djembe), Lance Iunker (drums), James Gallardo (standup bass), and Mark Pruett (keys). "I'm so excited for the lineup we've got right now, and with the help of a lot of rehearsals lately I think this is the best my Moonshiner Collective songs have ever sounded," Curcio said. "I'm really hoping that this current lineup will be a long-term consistent group and that we can build something great together. I truly love my bandmates as people, and they luckily happen to be absurdly talented as well, so life is good." 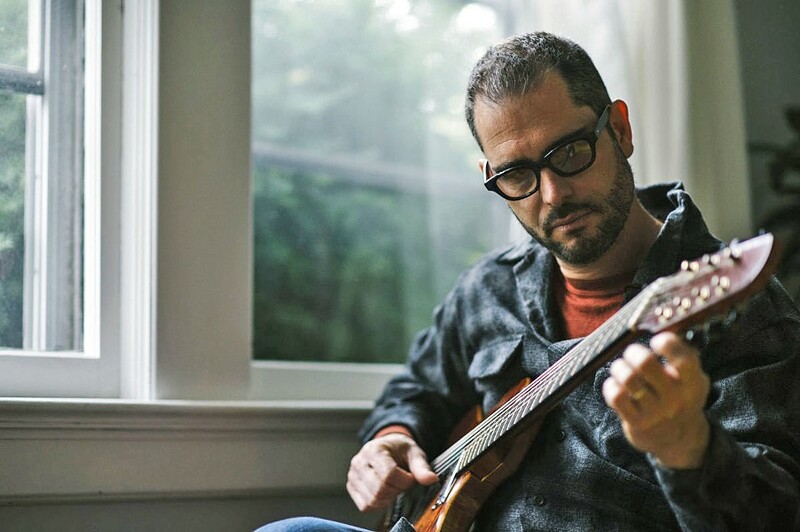 JAZZERNAUT Famed alt-jazz act The Charlie Hunter Trio plays at Tooth & Nail Winery on Dec. 8. Bring two or three canned foods to donate and get a free Moonshiner Collective CD. Numbskull and Good Medicine also hosts famed alt-jazz act The Charlie Hunter Trio at Tooth & Nail Winery on Friday, Dec. 8 (7 p.m.; all ages; $25 presale at ticketfly.com or $30 at the door); and, of Black Crowes fame, the Chris Robinson Brotherhood at the Fremont on Sunday, Dec. 10 (7 p.m.; all ages; $22 presale at ticketfly.com or $25 at the door). Check goodmedicinepresents.com for details. POWER TRIO Funk and jazz trio The White Blinds plays Bang the Drum Brewery on Dec. 10. 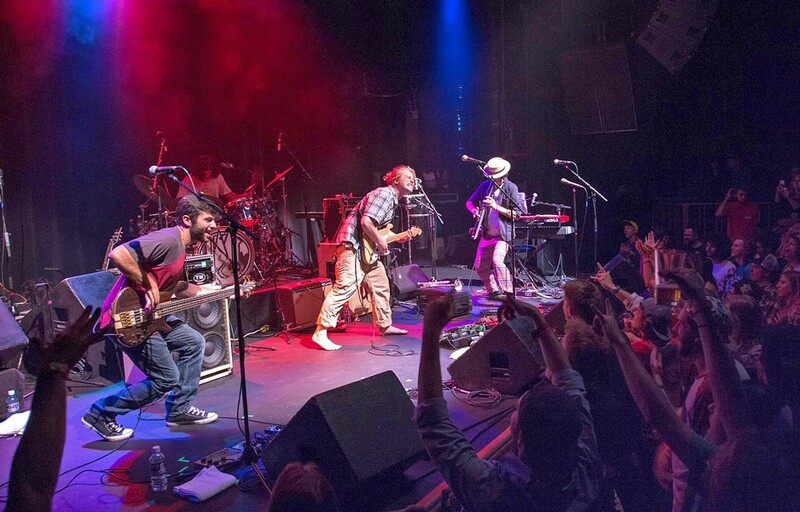 Reggae sextet Cheezy and the Crackers plays Frog and Peach on Saturday, Dec. 9 (10 p.m.; 21-and-older; free). The New Jersey-based act has been together for a decade. Funk and jazz trio The White Blinds plays Bang the Drum Brewery on Sunday, Dec. 10 (8 p.m.; 21-and-older; $5 presale at eventbrite.com or $8 at the door). The group features drummer Michael Duffy (Jungle Fire) and guitarist Matt Hornbook (who's toured as a secondary guitarist with Tedeschi Trucks). 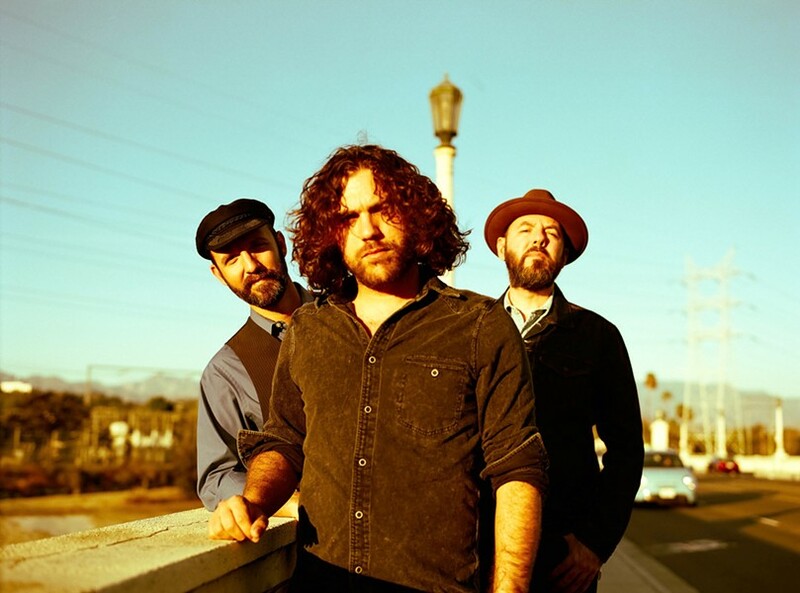 BOULDER ROCK Boulder-based rock act Amoramora plays Frog and Peach on Dec. 13.